(Nanowerk News) Robotic technologies have the potential to help neurosurgeons perform precise, technically demanding operations, together with virtual reality environments to help them navigate through the brain, according to a special supplement to Neurosurgery, official journal of the Congress of Neurological Surgeons. The journal is published by Lippincott Williams & Wilkins, a part of Wolters Kluwer Health. "Virtual Reality (VR) and robotics are two rapidly expanding fields with growing application within neurosurgery," according to an introductory article by Garnette Sutherland, MD. The 22 reviews, commentaries, and original studies in the special supplement provide an up-to-the-minute overview of "the benefits and ongoing challenges related to the latest incarnations of these technologies." Virtual reality and robotic technologies present exciting opportunities for training, planning, and actual performance of neurosurgical procedures. Robotic tools under development or already in use can provide mechanical assistance, such as steadying the surgeon's hand or "scaling" hand movements. "Current robots work in tandem with human operators to combine the advantages of human thinking with the capabilities of robots to provide data, to optimize localization on a moving subject, to operate in difficult positions, or to perform without muscle fatigue," writes Dr. Sutherland. Virtual reality technologies play an important role, providing "spatial orientation" between robotic instruments and the surgeon. Virtual reality environments "recreate the surgical space" in which the surgeon works, providing 3-D visual images as well as haptic (sense of touch) feedback. The ability to plan, rehearse, and "play back" operations in the brain could be particularly valuable for training neurosurgery residents—especially since recent work hour changes have limited opportunities for operating room experience. 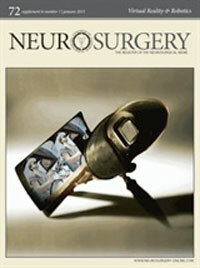 The special supplement to Neurosurgery presents authoritative updates by experts working in the field of surgical robotics and VR technology, drawn from a wide range of disciplines. Topics include robotic technologies already in use, such as the "neuroArm" image-guided neurosurgical robot; reviews of progress in areas such as 3-D neurosurgical planning and virtual endoscopy; and new thinking on the best approaches to development, evaluation, and clinical uses of VR and robotic technologies. But numerous and daunting technical challenges remain to be met before robotic and VR technologies become widely used in clinical neurosurgery. For example, VR environments require extremely fast processing times to provide the surgeon with continuously updated sensory information—equal to or faster than the brain's ability to perceive it. Economic challenges include the high costs of developing and implementing VR and robotic technologies, especially in terms of showing that the costs are justified by benefits to the patient. Continued progress in miniaturization will play an important role both in overcoming the technical challenges and in making the technology cost-effective. The editors of Neurosurgery hope their supplement will stimulate interest and further progress in the development and practical implementation of VR and robotic technologies for neurosurgery. Dr. Sutherland adds, "Collaboration between the fields of medicine, engineering, science, and technology will allow innovations in these fields to converge in new products that will benefit patients with neurosurgical disease."